The College Reporter | New shop Harvest Moon Bagel Co. opens in downtown Lancaster City at 47 N Queen St.
New shop Harvest Moon Bagel Co. opens in downtown Lancaster City at 47 N Queen St.
Once the Super Bread Colombian Bakery, 47 N Queen St. is open once again, this time with a new tenant and remodeled exterior. The shop is owned by Chelsea Zawisa and her husband who’ve been baking and selling bagels for a number of years now at places like East Side Market as well as supplying a local Lancaster City breakfast and brunch favorite, Commonwealth on Queen. Chelsea and her husband found out about the old Colombian bakery closing by chance when their home drier broke, hearing the news from the repair man who came to fix it. Seeing a golden opportunity to open a brick and mortar bagel shop, the two soon found themselves in a perfect location in the heart of downtown Lancaster City. Since the place had originally been a bakery, the location was ideal for the transition to becoming a bagel shop, already having equipment like a giant mixer which could be repurposed. The bagel shop, called Harvest Moon Bagel Co., is a must-see spot. 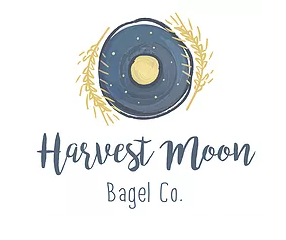 Sitting down with Chelsea to talk about Harvest Moon Bagel Co., it was clear that the company is dedicated to bringing traditional bagels to downtown Lancaster. What constitutes a traditional bagel you may ask? I soon learned that this referred to the practice of boiling a bagel before baking it. Unfortunately, this meant that my inquiry about the possibility of having a blue-striped “diplomat bagel” was good naturedly dismissed (adding food coloring to the process conflicts with this dedication to more authentic and classic bagel making) as Chelsea let me know with a smile that “you probably won’t see any rainbow bagels here.” I remain hopeful that a Diplomat Bagel may turn up as a promotional menu item in the future, however, because the idea of a bagel with blueberry cream cheese was suggested as a possible alternative. When asked how Harvest Moon Bagel Co. would appeal to college students, Chelsea directed me to the menu and its creative cream cheese options. While the bagel options themselves remain traditional, the cream cheeses are fair game for fun and seasonal changes, so look out for them on the menu. Chelsea also emphasized the appeal of the shop for students from New York and New Jersey specifically, noting that it may make them feel at home to have access to the authentic experience offered in her store. Students from Franklin & Marshall College will be sure to stop in and try out some new flavors as well as some old favorites in the future. Senior Abigail Sokolsky is the Arts & Leisure Editor. Her email is asokolsk@fandm.edu.